Virtual reality’s popularity is growing. Allie camera is launched in the beginning of this year and it is not only used for surveillance but is capable of recording events and also virtual reality videos. Allie 360 camera lets the user capture events in 360 x 360 degrees and we can share the videos on social network sites such as YouTube or Facebook. Allie 360 VR video camera can be used for many purposes. Kids or pets can monitor in real time. It is possible to create and also live stream 360-degree video content with this camera, and it can uploaded to YouTube. Other industries in which this can use are education, real estate, entertainment, hospitality etc. The VR content created with Allie 360 VR video camera can be watched on mobile devices also. The recorded 360 VR video can be accessed from the gallery and can be shared to Facebook and YouTube. Allie 360 comes with two lenses back to back. It features the 8-megapixel camera and inbuilt microphones and audio compression. Internal storage provided is 4.7 GB. The camera can connect to the 9v external battery bank. It is also possible to store the data in cloud allie.camera. The camera is WiFi, and Bluetooth connectivity enabled, and the images can share immediately. functionality which is not present in many similar cameras. Enabling it is easy and is done just by turning on or off or setting to Auto. The recorded 360 footage can save in the cloud. Cloud is the server that stores the video footage and the videos can be accessed, and it is also possible to see the timeline of recordings. The cloud recording can save on the device also. To set up Allie camera we will need the camera, a power outlet and there is also need of an internet connection. Allie home app needs to download. This can be downloaded either from iTunes or Google Play. Create the account, and you will be sent a confirmation link to your email. Confirm it, and they log in to the app account. Plus the Allie camera into power outlet. Allow the green light to turn on. This takes a couple of minutes. The light then turns blue, connect the camera using the app. To use the camera you need to specify the WiFi and the camera name. Place the camera in such a place that it can cover every corner. 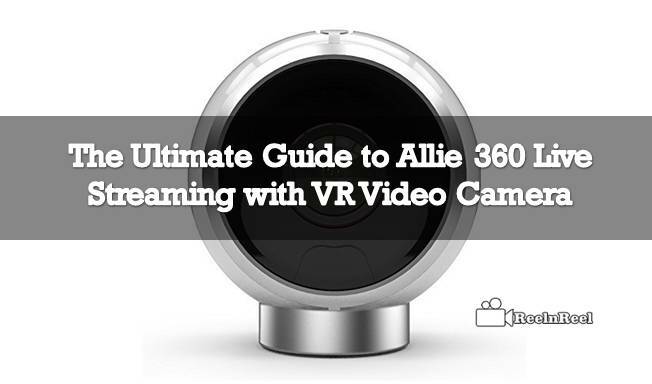 It is possible to live stream 360 videos on YouTube using Allie camera. Setting up is very simple. The content provider first should visit the YouTube.com website. Open the account setting. Find the ‘View additional features’ and see that live streaming option is enabled. After this go to the Allie app and click the streaming button. Open the Allie camera app and look for the live stream icon. Give a name to your stream and select the video quality. Now the video will be live streamed on YouTube. The stream can be shared with the friends and other interested people.